Ah - it was great walking the dogs without having to bundle up in a thick coat, warm shoes, gloves, scarf and hat. Just some sweats, a t-shirt and crocs! It's great to be back in wonderful San Diego! On Wednesday we made it to the Mephisto store (yes I bought some hiking boots and no they weren't on sale) and Angelina's. I wore the boots out of the store and my feet did NOT get cold. The evening wander was MUCH more enjoyable than previous wanders when my feet were getting numb from cold. The hot cocoa at Angelina's was YUMMY! Sooooo rich! They close relatively early (7PM) and, fortunately, we just squeaked in before closing time. Then we went to the Vesuvius italian restaurant and had dinner. Finally we headed back to the apartment, finished vacuuming and arranging the living room and hit the sack! Tomorrow I head out on a surprise trip with my mom (I can't say where we're going in case the person we're going to surprise is reading this ...) and I'll be wearing my new boots again since it's supposed to be cold and raining where we're headed. Enjoy your day and I hope you, too, have nice weather! Today is the day the "SALES" or, as the French say, SOLDES, start in Paris (maybe in France?). Many stores have items at 50% off starting today. After cleaning up the apartment (vacuum, dust, mop, ...) we're going to visit the Mephisto shoe store and see if I can get a pair of nice, well insulated hiking/walking boots so my feet won't FREEZE here. My old boots bit the big one when we were hiking on Maui and, since they are about 25 years old (if not older), I figure it's about time to get a new pair. If they don't have anything at a reasonable price then I'll just buy some from Land's End when I get back to the States. After we visit the Mephisto store we're going to have hot cocoa at Chez Angelina. This is actually quite a well known place for hot cocoa done right. I'm anxious to give it a try and I'm sure I'll be ready for something warm by the time we get there. We went looking for it yesterday but all I knew was that it was near the American Embassy. We finally found that (and they have VERY French hours - only open in in the AM and then one day from 1-2PM). There were a ton of gendarmes all around the Place de la Concorde, apparently getting ready for a protest. OK - off to clean! Hubby and I are in Paris right now and it is steadily getting colder! We had a couple of nice days where it was pretty warm (7C) and on one of those days I met up with a bead buddy, Muddy. 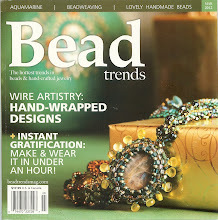 I sold some beads to her previously and we are both members of some online beading groups. 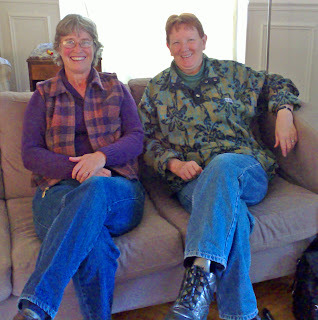 Here we are sitting on the couch in our apartment. We had lunch near Notre Dame and then went in search of the area of Paris that contains most of the bead stores. After walking around a bit - with a stop in another beautiful church, St. Gervais, another stop at a shop with absolutely GORGEOUS hairpieces, hats and dresses and a few conversations with folks to find the way - we arrived at Rue de Temple. Unfortunately most of the bead stores were closed since a lot of folks in France take at least 2 weeks off for Christmas and New Years. A few were open so we checked those out. The prices were MUCH higher than what I pay for wholesale so I just browsed. Saw a few unusual things but nothing that said "BUY ME!". Here is a picture from our apartment window of the snow. 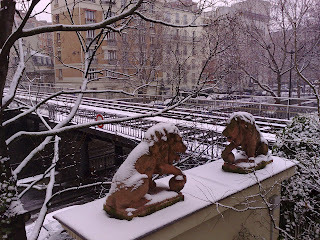 The lions guard the entrance to the apartment courtyard. 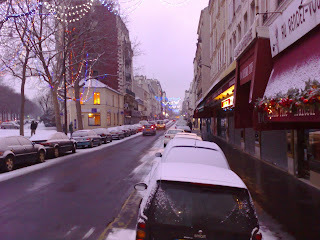 And, next, a picture of one of our favorite streets for grocery shopping - Rue Rendevous. It still has little cheese shop, bakery, fish shop, meat shop, wine shop, ... A very traditional French neighborhood in the 12th district.